Lucky I got new provider that give KVM based solution called VULTR. The name is bit strange for me but I knew about choopa. Parent company that deliver vultr. 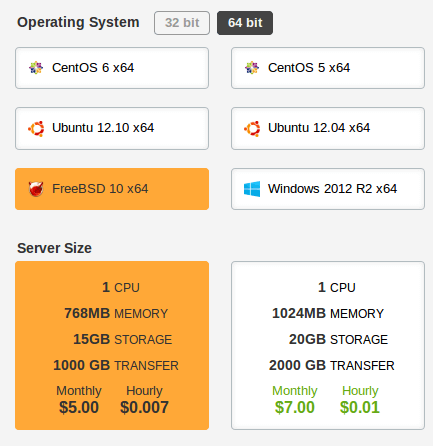 The website layout is looks like DigitalOcean and use the same virtualization (KVM). Signup process and utilization also close to DO and this approach is good for me as I don’t have to learn how to use it. I’m so exciting with this opportunity and would recommend it to my friends who looking for cheap freebsd box. I got one box and will update it with tutorial around FreeBSD. Ps : VULTR surprised me with promotion. I deposit $10 and they match it $10. So I got $20 for at least 4 month experiment using FreeBSD 10. Yippie!